'Are you sure we don't have an orange tree in the garden?' Akber enquired as he stared at the various citrus varieties in the kitchen. Spritely shades of orange and yellow line the kitchen counters, stovetops and cupboards. There have been oranges, lemons, mandarins and the coveted French clementines with leaves. A stark but welcome colour contrast to the dull and grey skies outside. Not that I'm complaining. We are all enjoying the the cooler climes that don't last long enough in Dubai. I've been testing recipes for a cake soon to be featured on the next issue of House of Fifty. A clementine, pistachio and semolina cake to be exact. Topped with candied clementines and coarsely chopped pistachios. Ever since I had a slice of lemon, yogurt and pistachio cake at Ottolenghi when I was in London, I have been dreaming of recreating the recipe. But I can't share the recipe with you yet. Trust me, it will be worth the wait. 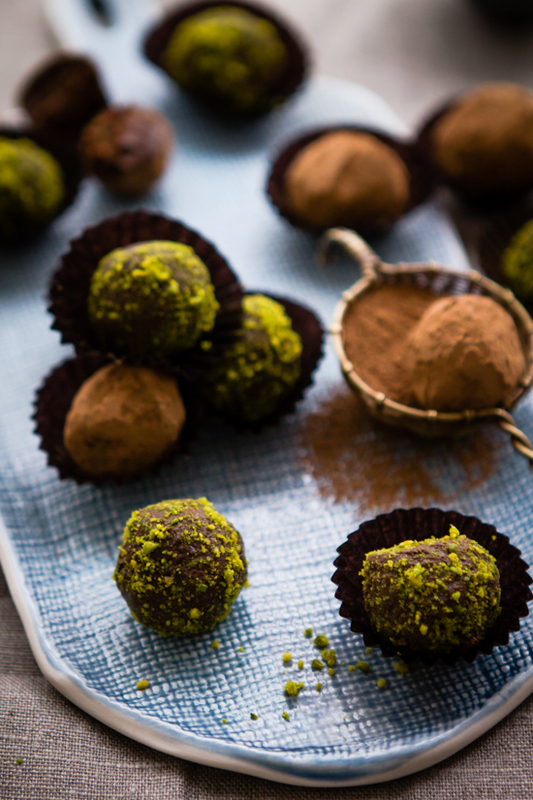 In the mean time, I have a simple recipe for truffles which has the same blend of flavours. Chocolate, orange blossom water, pistachios and cardamom. Gorgeous truffles! That is a wonderful flavor. 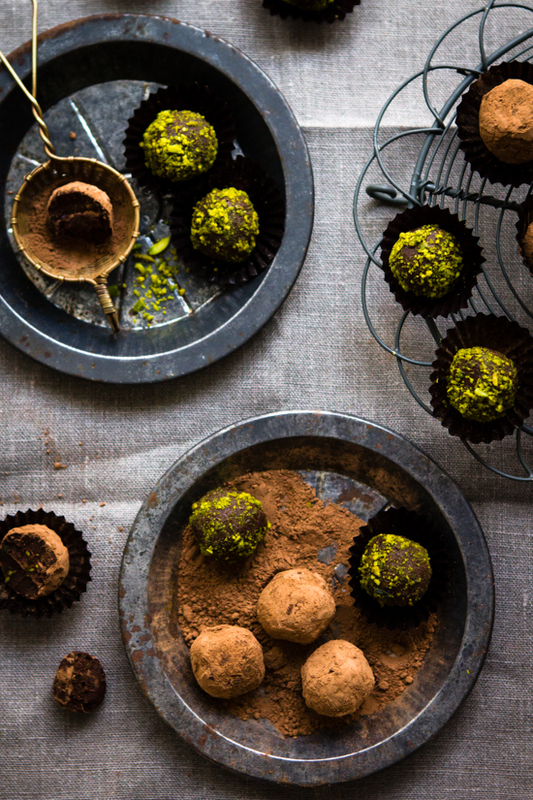 the light in first picture is phenomenal and so are these truffles. Look forward to your cake too. Happy holidays! These truffles look great and that cake sounds amazing. Good luck with it. Merry Christmas to you. Isn't that Ottolenghi yoghurt cake divine? 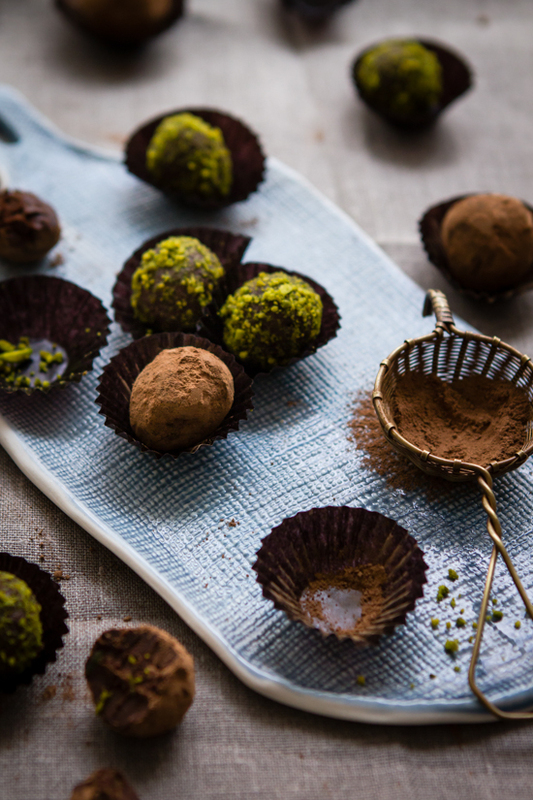 These truffles look pretty wonderful too - such a lovely combination of flavours. Looking forward to hearing all about the new cake when you can share the recipe too! I love these flavours and am thinking I should make and dispatch a box of these to my Mama. Ottolenghi is such a genius with flavours! And what beautiful photography. Some seriously fantastic flavors here and you know me, I can never turn down chocolate! 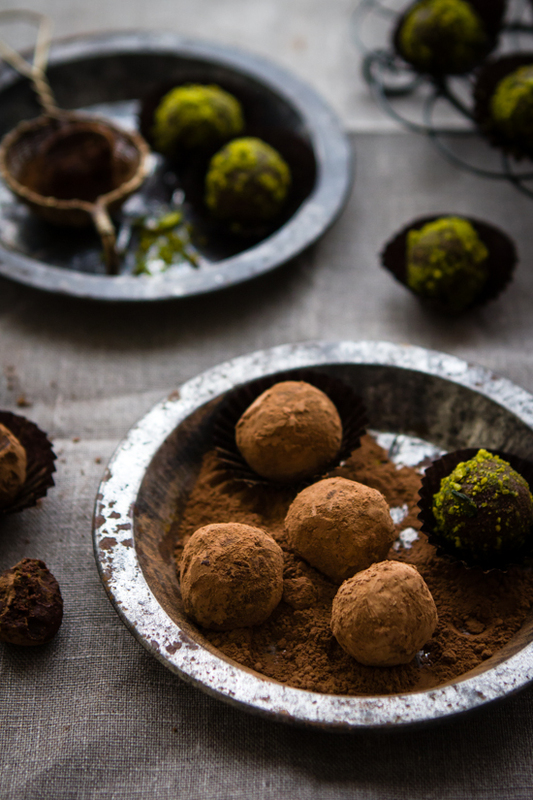 The truffles look just amazing and your photos are out of this world! Gorgeous! 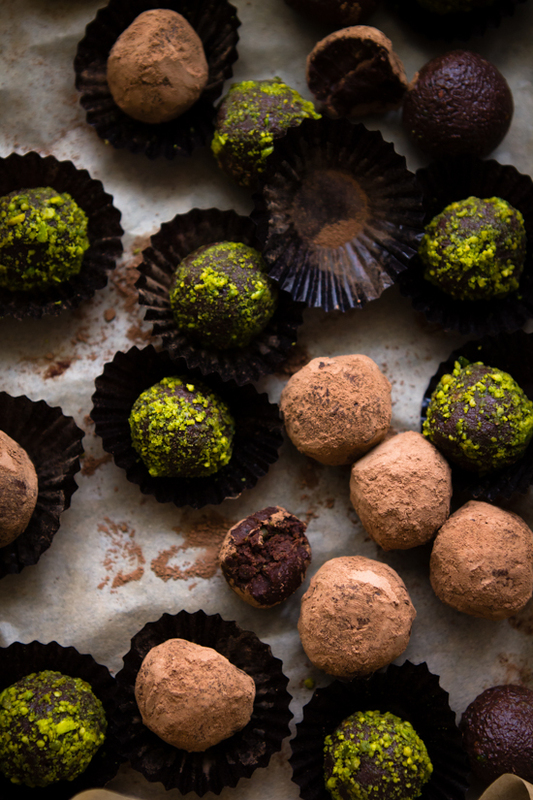 Truffles are the best desert on earth. It's that kind of food that you eat, enjoy and don't realize that you did eat that much !!! Tarnation! I made truffles just yesterday (for a dinner party tomorrow). These would have been wonderful, especially since my cocktail bites contain pistachios. Love the idea of a tie-in. Next time. How you tempt us! ; ) I look forward to learning your cake recipe once it's in print. 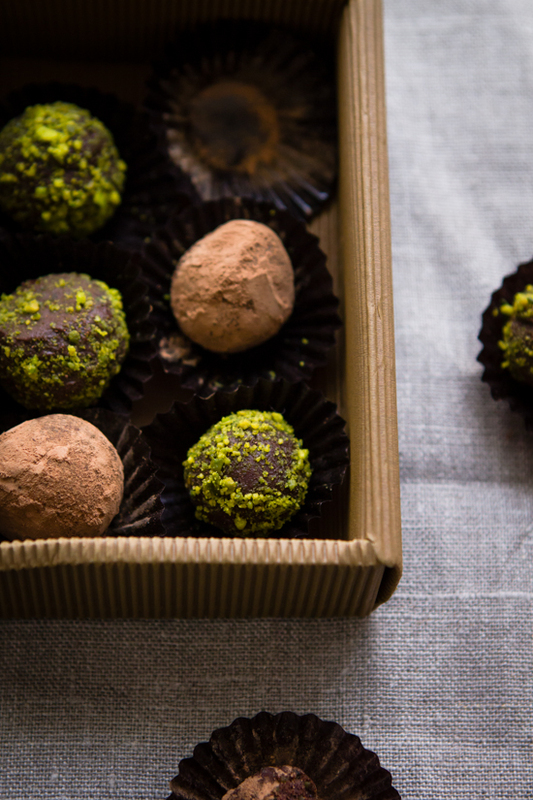 These truffles, however, are a fine substitute. So gorgeous! Love your photos. please what is the single cream ? Many thanks for sharing this recipe with us. I admire the way that you have used images to drive your point home. أرضية ممسحة وممسحة (إلقاء الضوء على منتج التنظيف في الماء لتجنب التكدس). المزيد من إرشادات تطهير المطبخ.